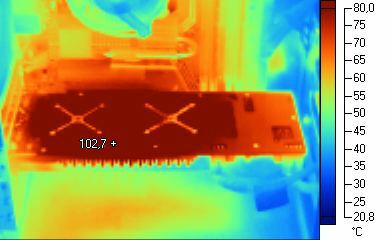 Here are the infrared pictures of a Radeon HD 4870 X2 and a GeForce GTX 285. 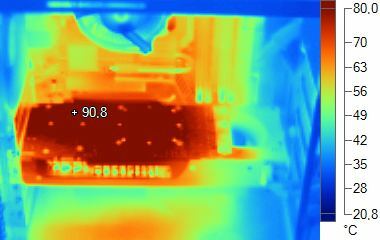 In idle mode, we can see that one of Radeon two GPUs is hotter than the other. Maybe the second is better cooled or the first does a little bit more work (displays Windows desktop…). 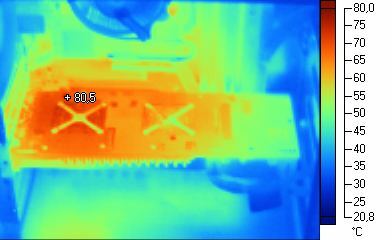 The GeForce GTX 295 has an efficient cooling system and manages to keep the temperature lower than the Radeon.